If you are serious about ROI? So is Infinity Tent Sales! We want you to be happy with you product you purchase. We know your tent will last for years and years, not 2-5 like some other manufactures. Once your customers see the nice white tents that last event after event, they will be renting from you again and again. This will allow you to grow and buy more. You can take advantage of our "SHOW SPECIAL". Stop by our Booth to learn more. This will be our First year exhibiting at the IFAI TENT EXPO. We would love to put a face to a name of some outstanding rental company owners, managers, and employees that we have became good partners with. 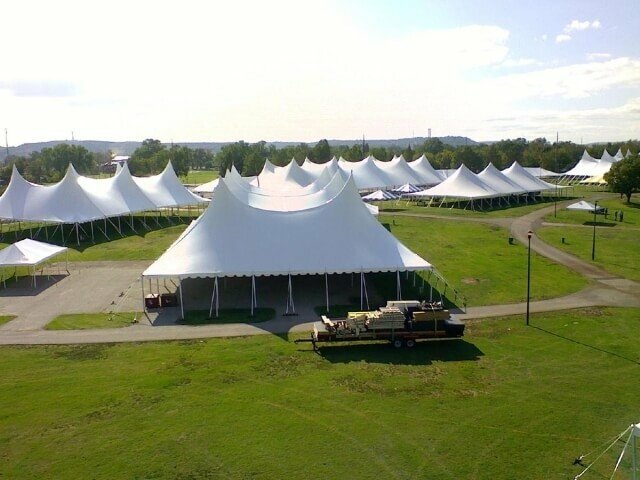 Infinity Tent Sales has been manufacturing party rental tents for sale for over 37 years. * Proprietary Heirloom Antique White Translucent Tent Material. * Extra Strong webbing reinforcement for our tension pole tents. * Samples of Wood, Aluminum & Teak Wood Pole wraps. * Samples of our High Quality Party Tents. * Our Tent Repair services. These are just some of the things that can make us YOUR Tent Manufacturing Provider. DID YOU KNOW... We use first quality products; we buy the same supplies as other larger manufactures. we are very competitive in price and with the quality you expect. Our tents are made in the USA. Being centrally located in the United States with equal distribution throughout the country, we can save you money on freight. Kansas City’s based Infinity Tent Sales moved in a spacious 60,000 sq ft warehouse. To keep up with the demands of our customers, we currently run extra shifts at no other cost to you. With quicker turnaround times, we can get what you need when you need it. With in this space, we have almost doubled all of our tent manufacturing equipment. Being apart of an experienced Party Rental company with over 30 years , we have developed our tents to be one of the best quality & lasting tents in the market. We too want the tents to last year after year just like you would want. We put pride in every tent we make. We offer financing so you don’t have to tie up your capital and this allows your company to grow. We offer a full 1 year warranty against any manufacturing defects. We can send you samples of our material & our manufacturing process.